Will Resume Shipping Around 5/15/2019. 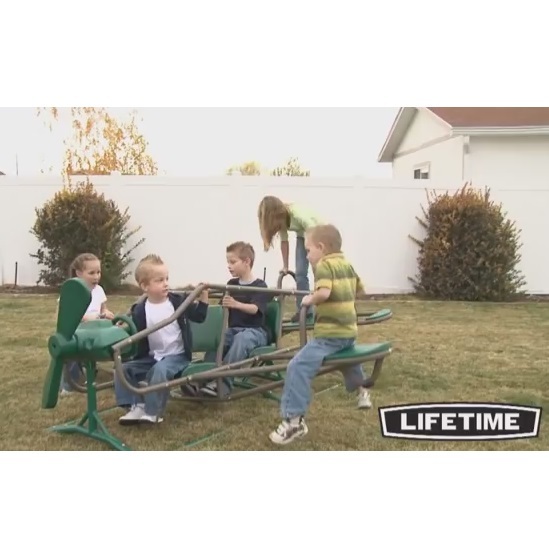 Lifetime Airplane Teeter Totter - Ace Flyer 90135 Earth Tone Double Play Gym. 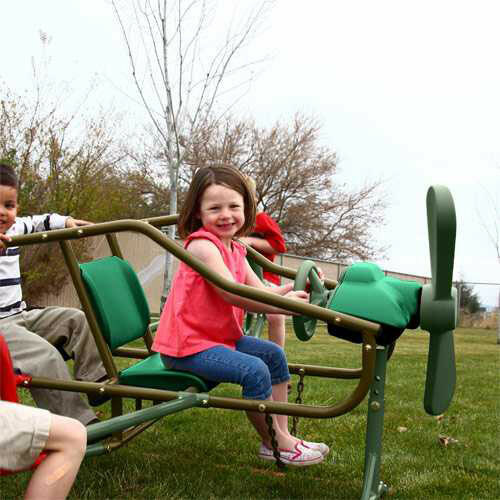 Get kids' imagination into high gear with the Ace Flyer Airplane Teeter Totter. 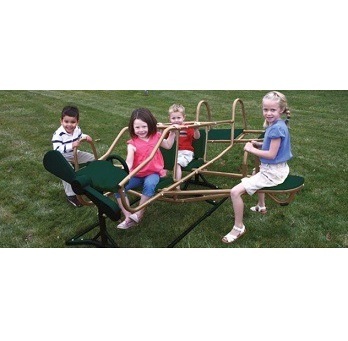 This teeter totter, now available in earth tones, features a steel frame and polyethylene plastic components. 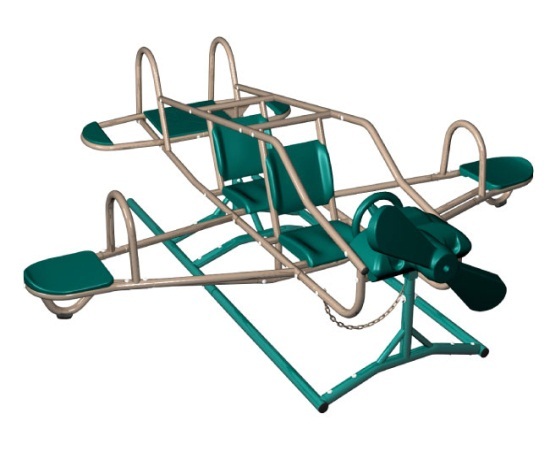 This teeter totter passes all current safety requirements for playground equipment. 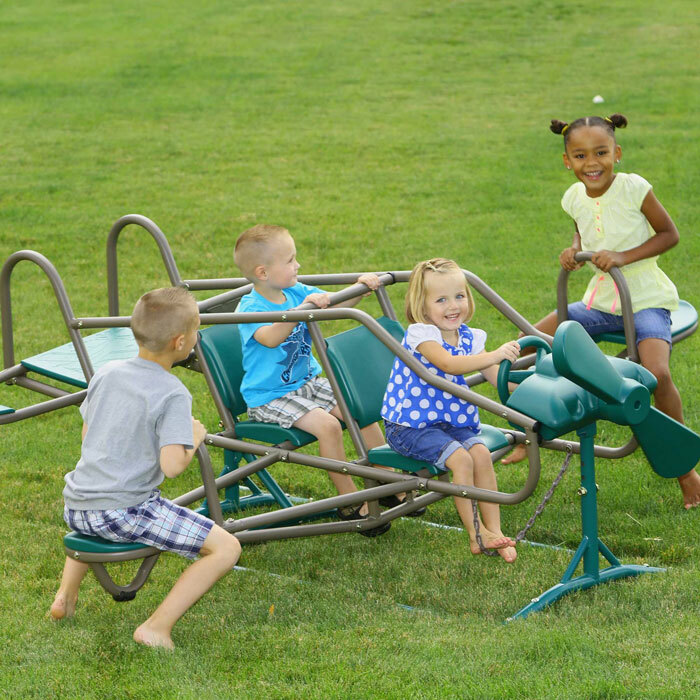 Unlike some outdoor play equipment, this teeter totter uses a finish that protects against parts of the system overheating. 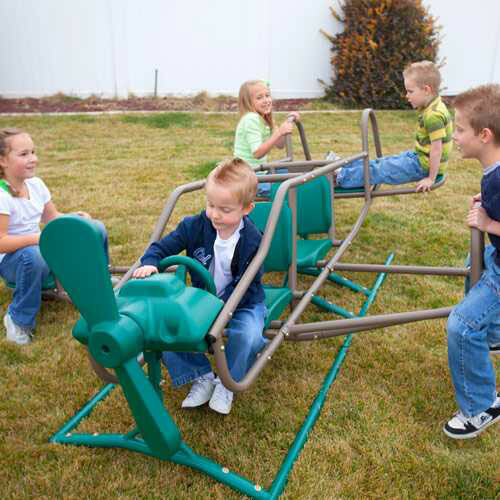 This sturdy airplane teeter totter features a steel frame with 7 occupant positions and a weight capacity of 600 lbs. Order your teeter totters here. Maximum Capacity - 7 children at once. Teeter totter moves side to side and up and down. Powder coated steel parts to help resist corrosion and rusting. 1-year factory warranty from Lifetime Products. Weather-resistant finish on all parts of the system. Safety Footprint: 8.5 Ft. x 8.5 Ft. Assembled Dimensions: 99.75 inches L x 94.8 inches W x 33.5 inches H.
Shipping dimensions 49.5 inches x 22.25 inches x 13 inches. 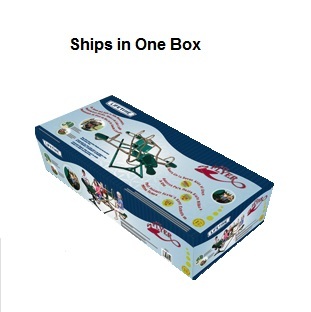 Product ships directly from Lifetime Products and generally leaves the warehouse with 2 business days. This teeter totter generally ships via FedEx using standard ground service, which usually takes 3 to 5 business days in transit. Product weight: about 105 lbs. This unit is also available in the primary colors Airplane Teeter Totter model. The only difference between these two systems is that the 151110 are primary colors and the 90135 is earth tone colors. I spent a long time selecting what I thought would be the best outdoor playground equipment for four young children ages five thru nine. I made an excellent choice. They love it. 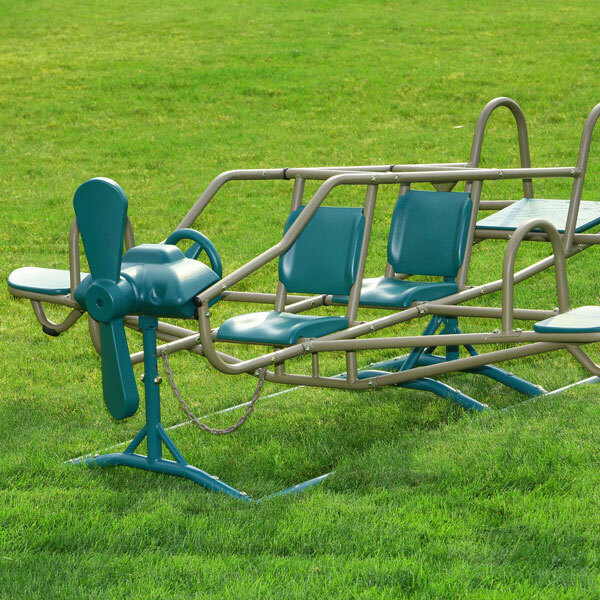 They can move around to the seven different seats for extra fun. Of course they all want to be the driver but there is plenty of time for each to have their turn since we got it in April. 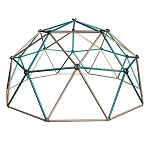 It is well built plus with safety in mind, easy to put together and what we really like is that it was available in earth tones. The price was far the best on the web. We plan to add other items from this company in the near future. The daycare and my own children love it! Fantasy and large motor play. Sturdy. Like that the seats are hard plastic vs. cushions like my last one, which deteriorates in the MN climate. It takes more than 1 hr to assemble ... ..2-4 hours ... and my husband is a contractor by trade! It would have taken me a whole day I am sure! Excellent for entertaining lots of kids! My Grandma has the colored flyer and it is a great toy. My siblings and I love to play on it when we visit her. She has had it for several years and it is still in pristine condition. My grandma also has an older seesaw that is metal but it is very rusted and has sharp edges. 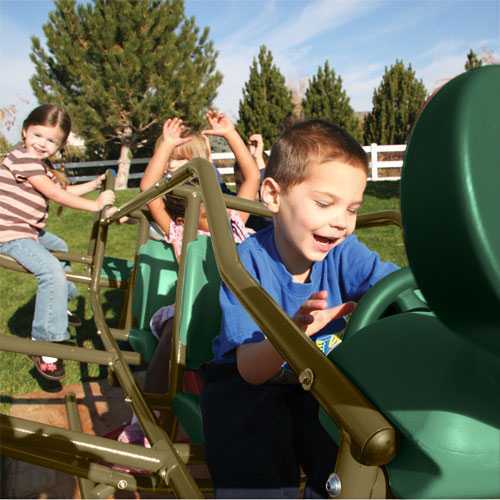 The ace flyer is Great for kids of all ages and is quite safe. I am very excited about this product but could not put it together because several pieces were missing. The box was damaged during shipping and the pieces fell out. Now I am waiting for the replacements to arrive. All four grandkids(17 months to 6 years) will be here next week and Im so excited for this surprise for them! My husband began helping with the assembly, but when I had questions, he decided I could do it myself and I did. Every single part was there with none left over. Be sure and follow the complete instructions, especially when it reads "note". It also suggested 3 adults for assembly, but that was a matter of balancing at one point. I was able to do it by myself. I did take my time and it did take quite a while, but I am so pleased with the results. In the end, "Grampy" was a great help finishing the tightening of the bolts, so he also gets credit for the new toy to be enjoyed by all our little ones. 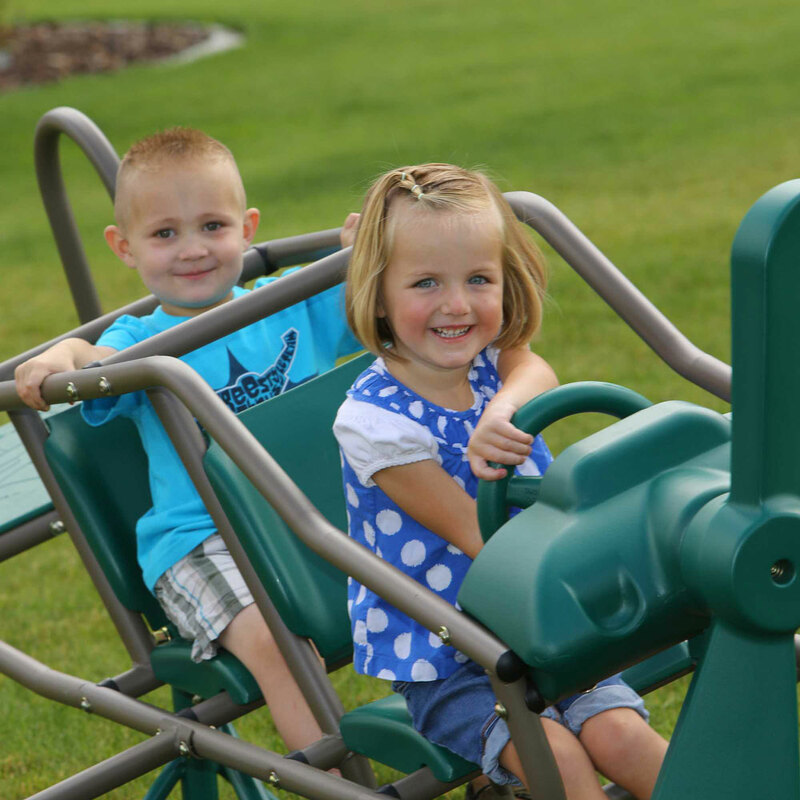 I bought the Ace Flyer Teeter-Totter a year ago and my grandchildren just love it. Being a pilot and having several in the family it was especially fun to give this gift to my grandkids. They love the bright colors and pretending to fly like Grandpa or their Uncle's Shane and Tyler. Its well built and will give years of fun on the playground in their yard. So much easier to assemble than expected. Took one person 4 hrs and done. Our 18 month old grandson loves to climb around on it as well as our 9 year old grandson. Q: Do you match other online prices? A: Yes, we will beat any online advertised price by $10. Q: It says there are 3 adjustable heights for this airplane and I cannot find what these heights are, can you please provide those measurements? thank you! A: This Teeter Totter Adjusts in 1.5” increments. Please see the instructions for more detail. Q: Does it come with anchors or do I have to purchase it separately? A: It does not include anchors, but we never needed them. It's plenty stable enough with the bars at the bottom that run the entire length, even when it's full of kids. A: This product does not include anchors-they are not required. Q: What different types of base/ground can I put this on? A: You can put this on most flat, dry surfaces. Q: What age is this made for? A: Children ages 3 to 10 years old. Q: What is the size of the base? Q: Can this be used on a playground with 4" of mulch? Just curious if that would affect the range of motion on this. A: That shouldn't affect the range of motion. A: It's adjustable - about 2 feet. Q: I ordered this and it got canceled. If it is out of stock why did you e-mail me that it is back in stock? Why does the site say it's available? A: Product is now back in stock as of Feb. 2016! A: Sorry about the glitch. It is now back in stock as of February 2016. A: We can but shipping is costly. Q: when is this back in stock? A: Unfortunately, this will not be restocked until the spring. Q: Will you ship to Mexico? A: Unfortunately, we do not ship these items internationally. Sorry for the bad news. Fast Shipping: Orders for the Lifetime 90135 generally leave the warehouse within 1-2 business days. Dimensions: 50" x 22" x 13"